‘Birch Hybrid’ is a low growing profuse bloomer, at 4-6” tall, with nodding lavender-blue flowers. 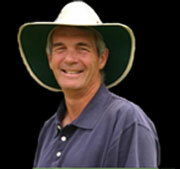 Blooms continue from late spring to late summer with regular deadheading. Rapidly spreading toothed foliage creeps through cracks and crevices, perfect for stone walls or walkways. Family that grow together, stay together. 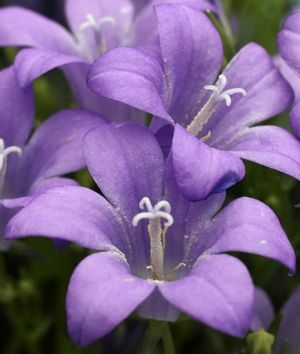 This gorgeous flowering perennial looks great when paired with it's own kin, Campanula 'White Clips' or 'Blue Clips'. 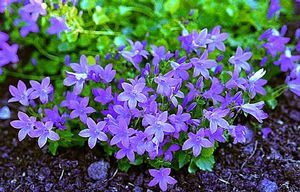 Campanula are versatile perennials providing a wide range of colors, shapes and uses. Many varieties offer long bloom time and easy care, while others feature some of the best blues and deepest purples in the perennial world. Remember to deadhead (garden scissors should be preferred) so the blooms keep coming. 'Birch Hybrid' does not give the same kind of second flower flush as the first blooming time. 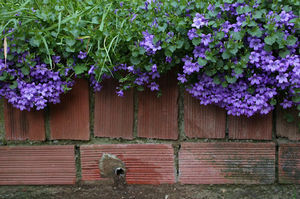 Remove about a third of the plant after blooming to freshen the foliage. Can be divided every 3-4 years in spring or fall. © Copyright 2019 | Treadwell Plants | Site Produced by Clarity Connect, Inc.